Maximum 6 characters. 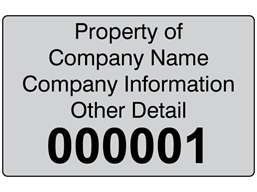 The labels provided will be number consecutively, starting at the specified number. Please use a new line for each line of text. Maximum 25 characters, per line. Maximum 4 lines. Click here to see further artwork instructions. Asset labels and stickers. Part of our Asset and numbered label range. Assetmark label with upto 4 lines of custom text (upto 25 characters per line), and consecutive number sequence. Material self adhesive vinyl, with clear laminated surface. Supplied in rolls of 500 labels. Serial number labels. Assetmark. Consecutive serial number with four lines of custom text (upto 25 characters per line) in black. SV04 Size 32mm x 50mm. Material self adhesive vinyl, with clear polyester laminate.